Made high quality eco-friendly wooden material,smooth,Non-toxic,offer a healthy sturdy environment for your kids. Simple V design,easy to assemble,sturdy stand on the desk,organize your book,magazine,earphone in right place,easy to view all your books,keep your desk tidy and clean. 5 Stylish and young Color option,fit for unisex and different ages,simple but elagant,color will never fade out if put it without strong sunlight. Easy to clean,just use warm cloth wipe down,regularly clean it will keep it fresh color and long lasting using. 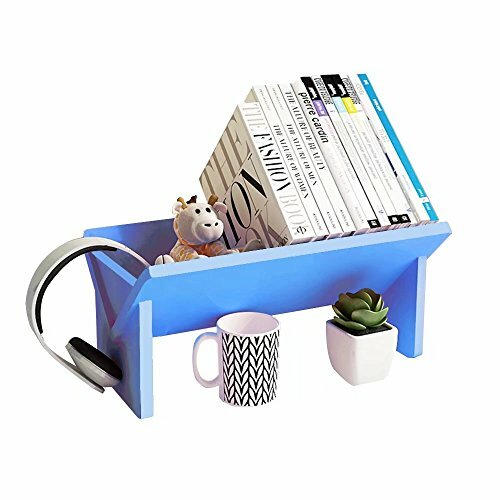 A pretty book organizer match any home,office decor,add you desk more charming and creative,2 OR more would be recommended. The books and earphone show in the images are not include. This bookends need to assemble by yourself with screws, and the screws will package with bookends together. Please allow a little color difference between images and item due to different monitor and brightness of computer, thanks for your understanding!